It really doesn't take much to persuade me to spend time in the forest. 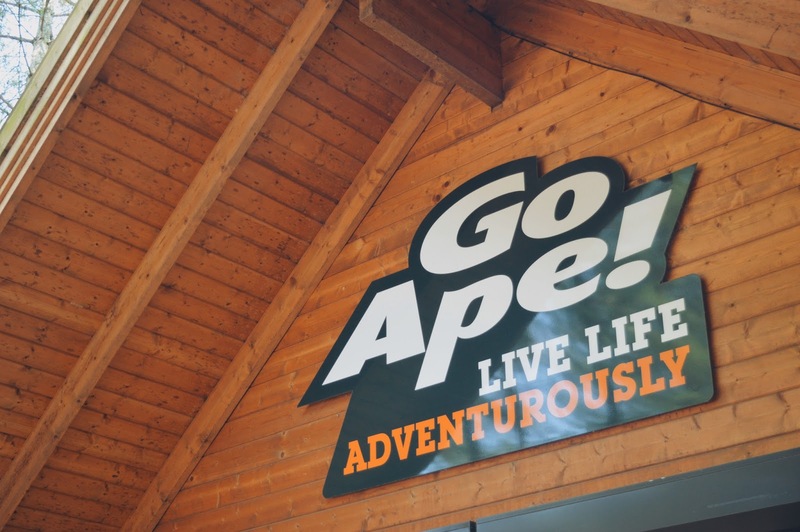 So, when I received an email from Go Ape! 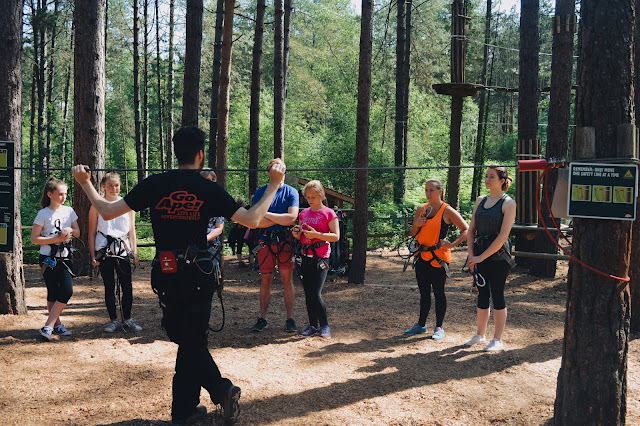 inviting me over to their Moors Valley site for a go on their Tree Top Adventure course, I didn't give it a second thought. Even if the notion of climbing ladders, balancing on wires among the treetops and free-falling into rope nets did make a tad nervous. To clarify, "a tad nervous" could also mean "I ended up crying when crossing a rope net to get from one podium to another" on my second ever visit. But hey, in fairness, I did a 5K park run before that. This girl was tired! 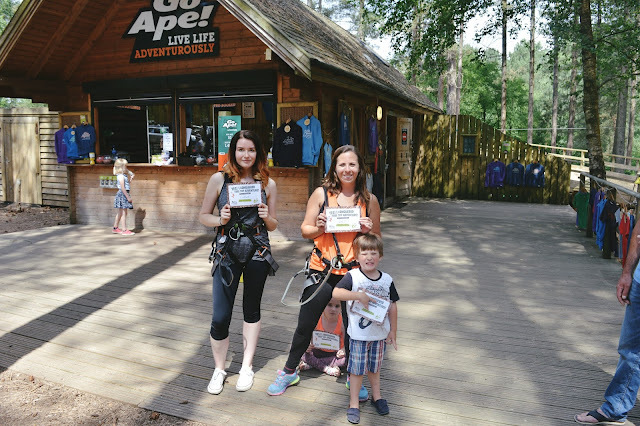 This time around, which was my third visit at the lovely Moors Valley site, I was accompanied by Kieran's sister Rikki. 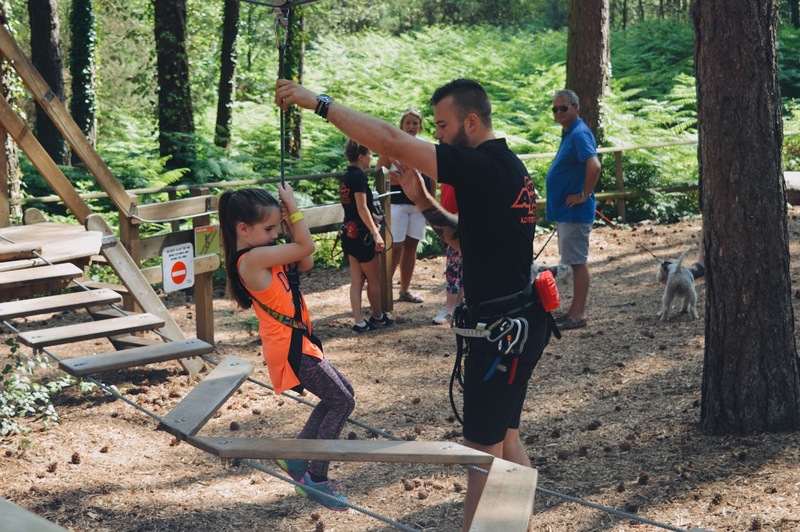 This was while her fiancee Matt, and children Olivia and Charlie, took on the Tree Top Junior course which is suitable for little adventurers over one metre tall. After combatting the entire course on my second visit, I was feeling pretty confident about taking to the treetops again and (hopefully) reassuring Rikki that it wasn't as scary as it seemed! Despite my nerves, I have to say that having my own fiancee Kieran, who's an instructor at Go Ape! himself, sort out my harness, remind us of the safety guidelines and show us the ropes made me feel more at ease. That's not to say that my legs didn't start to shake a little after climbing the first rope ladder and preparing myself to walk across wooden steps joined with rope, climbing up nets and shifting one foot at a time to get across a thin metal wire (while gripping onto the one above my head for dear life). And this is just the warm up course after your introduction! For me, all of the nerves and precarious wobbling over platforms is made completely worth it once you reach each zipwire at the end of each course, of which there are four (five if you include the intro site) where you're rewarded with the feeling of flying through the sky. This is followed by a not-so-graceful landing (unless you're a pro of course) into wood chip at the bottom. And yes, I did once lose a shoe. So, if there's one thing you learn from this blog post, it's to tie your damn shoes up properly. Out of all of the courses, I have to say the final site was my favourite. I was disappointed in myself for not taking the site on during my first ever visit to GoApe! last year, so I've faced it head-on during my second and third go. 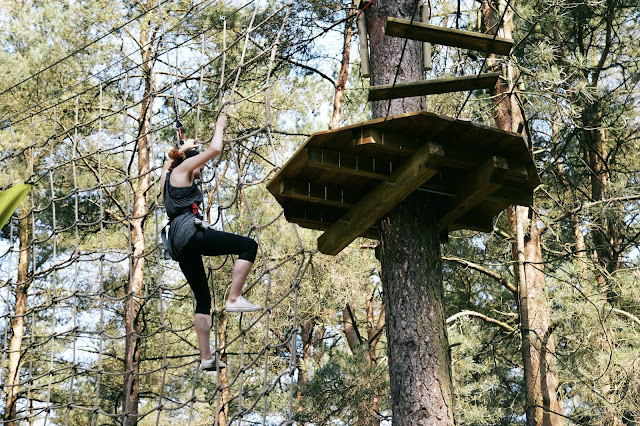 There's nothing quite like the feeling of letting go of your fears and trusting your harness completely as you step off a towering platform and free fall into the Tarzan swing. I'm proud to say I still let out the most ridiculous scream. 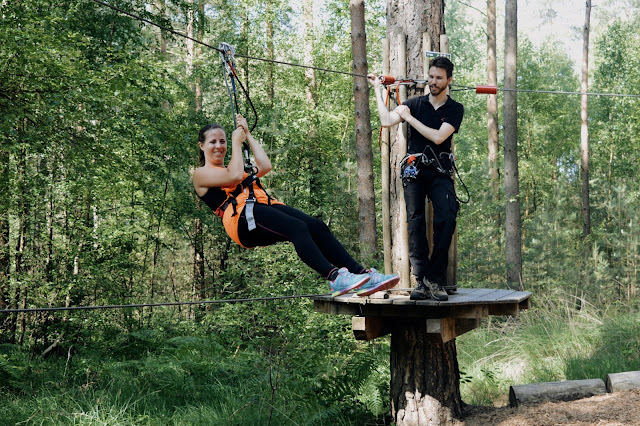 So, whether you're looking to take on a challenge to overcome your fears like me, are a lover of adrenaline inducing activities or just love spending time in the forest, I couldn't recommend Go Ape! enough. 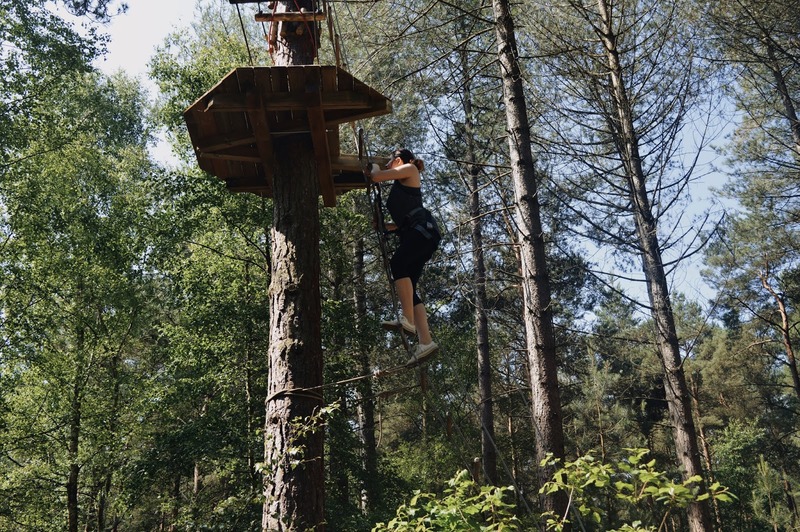 For someone who was once petrified of heights and didn't think they'd overcome it, I'm glad I accepted their offer and gave it another go. Even if I did end up washing wood chip out of my hair for days. It's such a great feeling isn't it! I have to admit that I've still got my certificate still proudly displayed on my memo board at home. Would definitely be up for going back!